Someone’s having the best week ever! 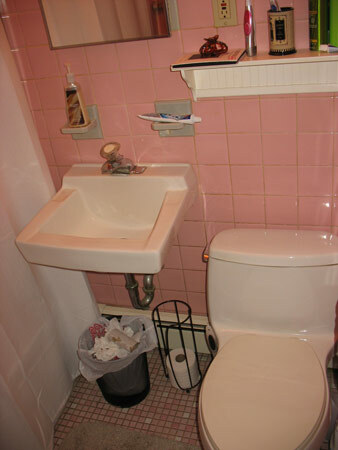 The 1950s pink bathroom shortly after we moved in and started trying not to hate it. 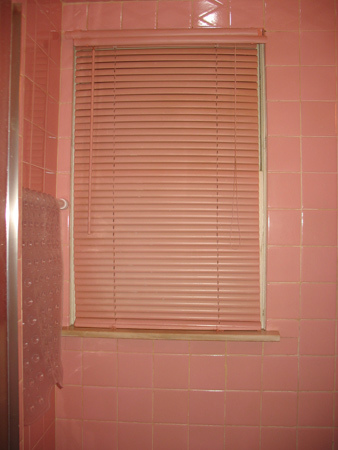 Yep, that’s a window…in the shower. 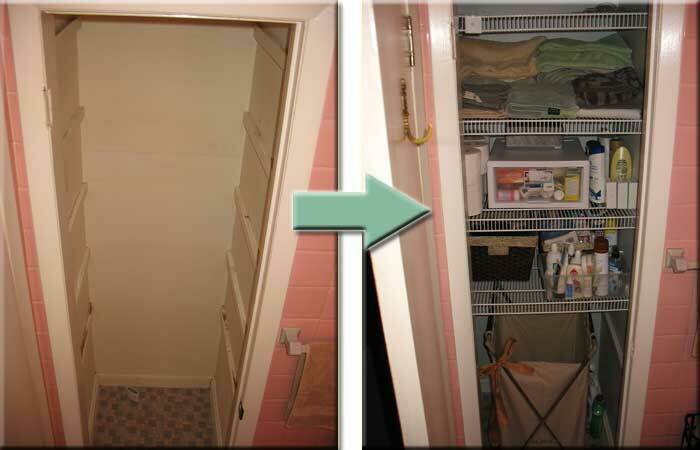 The linen closet before we gave it a piece of our mind. Yes, the straw that broke the camel’s back, the icing on the cake, Custer’s last stand, every other idiom and reference that has to do with being pushed beyond our breaking point. 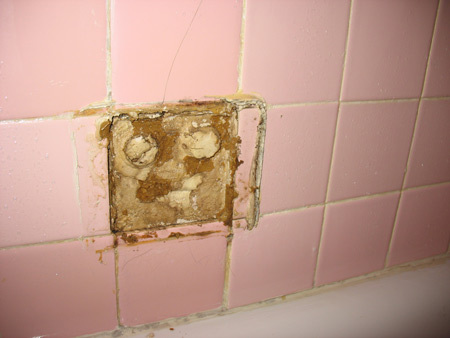 There was so much water damage behind these tiles, I was able to literally just pluck the soap dish right off the wall. 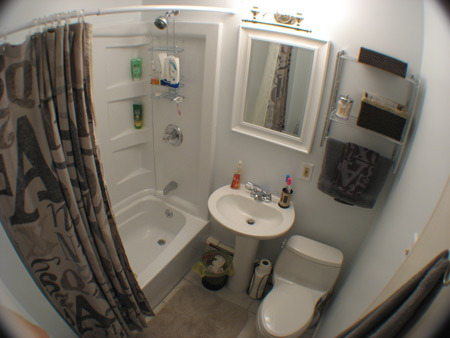 So we called up our buddy Mike – the man, the myth, the legend who installed our new dishwasher – and he hooked us up with a sweet deal on a brand new bathroom! Installed a new vent fan (sure beats a window in the shower that won’t open)! 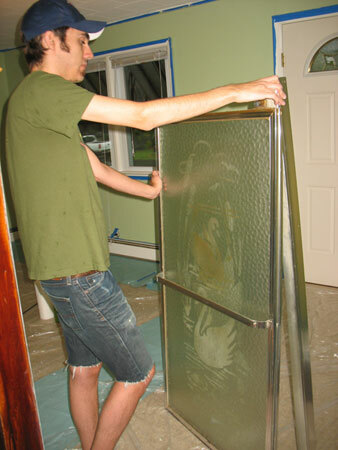 Then he went to town, building us a new bathroom. 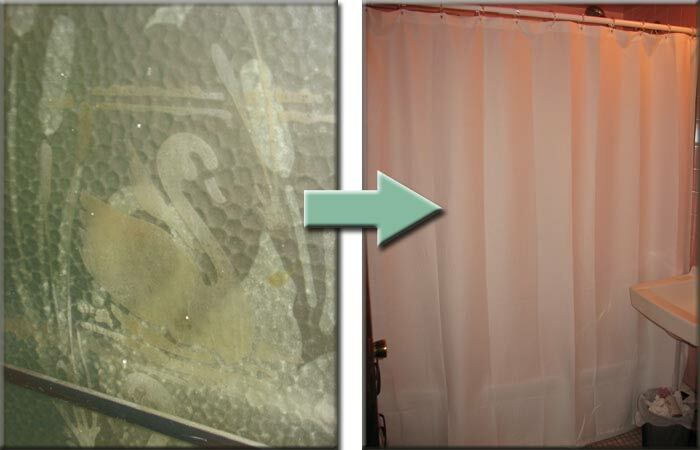 Goodbye, window! 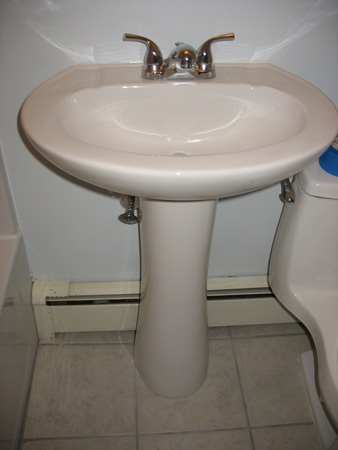 We love this new pedestal sink (and it was only $50)! The new tile is way better than those tiny little gray and pink squares. 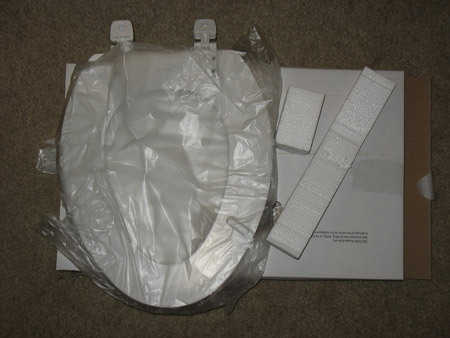 And a new Kohler toilet seat for the only fixture we kept from the original bathroom (besides the light fixture). We painted. Behr “Fresh Day” and a fresh day it was! And finally, the fun part! Adding a new mirror and a practical shelf/towel bar. 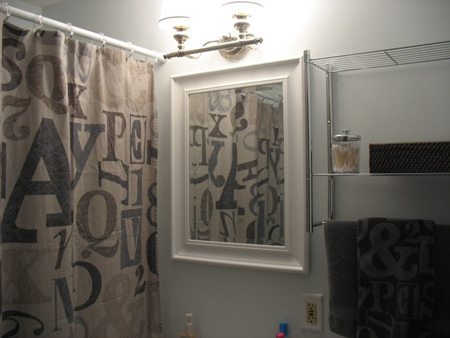 Bringing our beloved typeface shower curtain back into the picture and coordinating the colors we always wanted in our bathroom. The ultimate before and after. 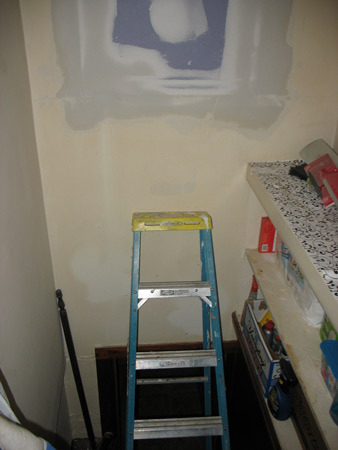 So you saw the first look at our bathroom remodeling project when we posted some pictures of the demolition on Monday. 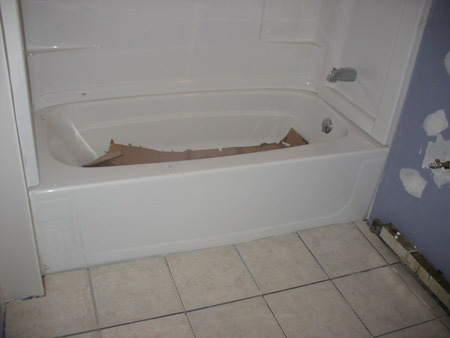 Now the walls are up, the window has been filled in, the tub is in place and the tile is on the floor. Here is the view from the stairwell. It’s looking down to the basement, but more importantly it is looking at what used to be a silicone sealed window to our bathroom! 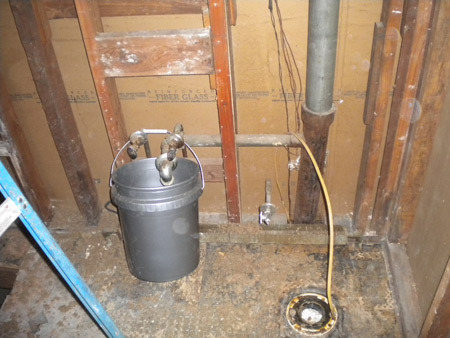 I’ll be honest, we had problems with mildew and moisture in the bathroom. 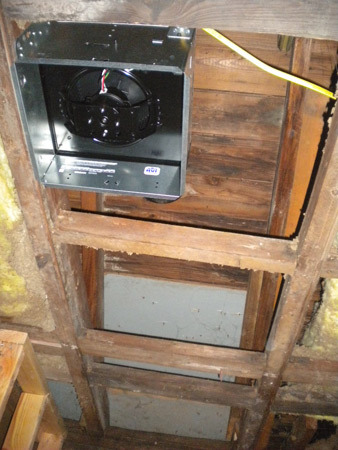 I have a feeling that the vent fan, the removal of the window and the installation of the g-board instead of tiled walls and ceilings will fix that problem. 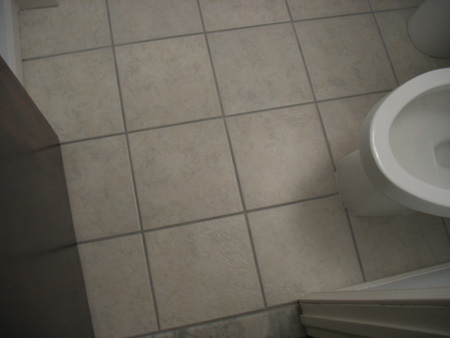 Not to mention this whole project is solving our collapsing tile problem. 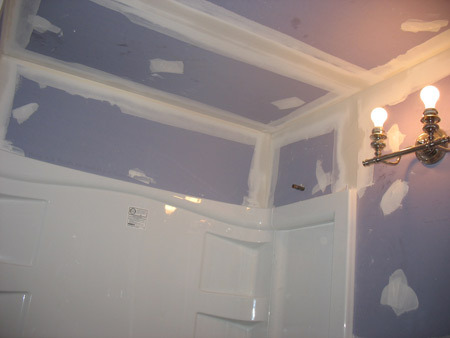 Our remodel man, Mike was also able to remove the lowered ceiling over the shower. I’m not really sure what the purpose of that was, but maybe it had something to do with the lovely shower doors we had when we moved in. 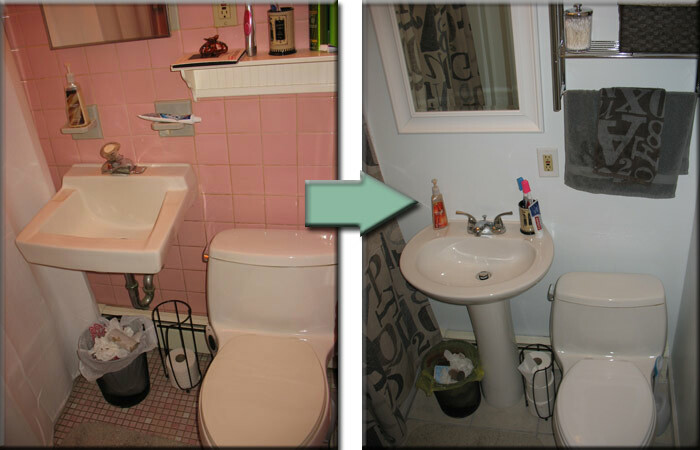 We’ve also upgraded from 8,000 little 1″ x 1″ pink tiles to maybe 50 12 x 12 tiles. 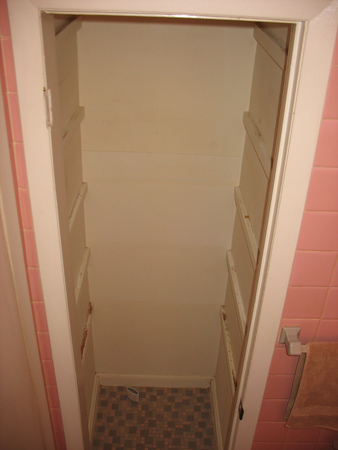 I can’t wait to put my feet on something solid every time I get out of the shower instead of something that feels like a jigsaw puzzle. Huge thanks to Mike from Hammertime Home Remodeling. 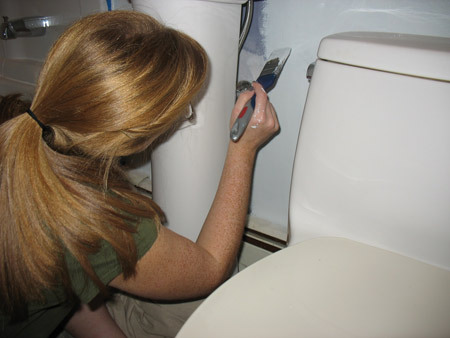 If you’re in NJ and you need a new bathroom, he’s your guy. 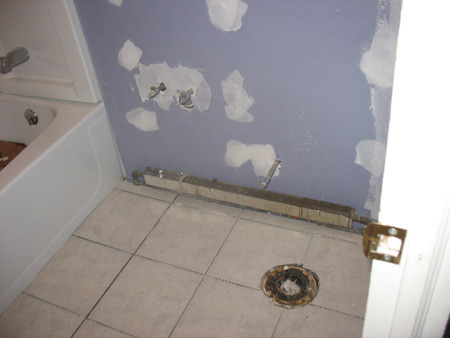 This afternoon, the sink and toilet went in. This weekend we will start painting! Keep an eye out for some updates on our progress within the next 48 hours.